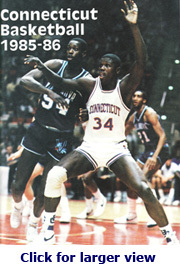 Tim Coles was a Forward for the UConn Huskies from 1982 – 1986. He’s a member of the UConn Basketball All Century Ballot. 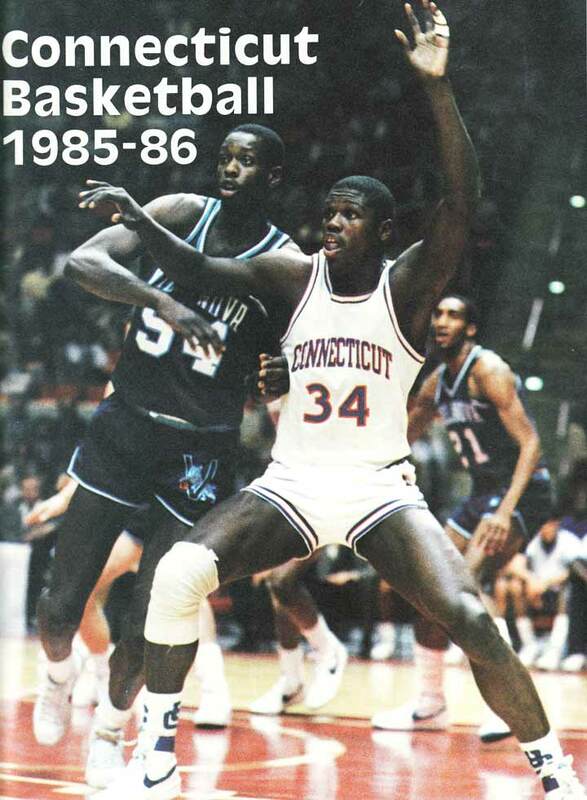 He scored over 1,000 points, and more than 800 rebounds while at UConn. Recently Tim was voted among the top 25 All Time Catholic League basketball players in Baltimore City. I had the opportunity to talk to Tim by telephone from Baltimore in August 2006, as he reflected on his basketball memories and experiences. Tim grew up in Baltimore City, Maryland, and as a youngster played for a number of local teams. He lived about 100 yards away from Saint Edward’s School, and when he was supposed to be sleeping, he’d sneak into the gym to practice his basketball skills returning home in time to get ready for school. his junior and senior years of high school. Tim was recruited by several colleges and narrowed his official visits to Virginia Commonwealth University, Syracuse University, UConn, Depaul University and Georgia Tech University. “UConn had everything I wanted. When I went there I was fully immersed in the whole college experience.” Coming from Baltimore City Tim welcomed the country lifestyle in Storrs. He was impressed with UConn particularly because during his visit he stayed on campus in a dorm getting the real feeling of what college life at UConn would be, unlike recruiting visits to other schools where Tim stayed in fancy hotels. Tim graduated from UConn with a Bachelors Degree in Marketing. After graduation Tim traveled to Europe spending time playing basketball in Holland, Greece and Sweden. While in Greece his team made it to the World Championship but lost, and while in Sweden his team finished second place in the playoffs. After three years, Tim decided it was time to come back to Baltimore moving on to the next phase of his life. He began working for Eastern Airlines as a ticket agent, where he was given the opportunity to learn some cockpit training, too. With the experience gained in the airline/travel business, Tim’s next job was at Iron Mountain, where he was a transportation manager for the next 15 years. Within the last couple of years he has moved on to IBEXX, a laboratory for animal blood testing where he is the transportation manager. Tim’s thoughts on Coach Calhoun are, “I think he has done an excellent job, he’s a good leader, demanding, and he brings a swagger to UConn that they were missing.” As far as the game of basketball changing through the years, Tim believes that today there is more show boating, and free style moves compared to when he played when basketball was more about fundamentals. Tim and his wife, Rochelle, have been married for more than 15 years. They have three children; a son Anthony, age 21, who currently is enrolled at Lincoln Technical School where he’s learning automotive skills. Their daughter Lekeysha, age 14, is a high school student, and a member of the Ft. Meade high school basketball team. Their son Debonte is age 10, and is very involved in the sport of boxing. In addition to working full time, shuttling the kids around with school and sports, Tim and Rochelle are also very involved with their DJ services business called T & R Productions Plus.